We understand that Christmas is about traditions. Many of these traditions are universal, but what is considered the “traditional Christmas tree” is different depending on what part of the country you live in, and even that has changed over the years. It used to be that families used whatever they could cut in their backyard or surrounding areas. So in California, for example, the traditional Christmas tree was a pine. And in the northeast it was a balsam fir. Nowadays, Bear Canyon Tree Farm ships about 25,000 Noble fir to California, and many young families there have never had a pine in their homes. No one was cultivating Christmas trees until about fifty to sixty years ago. See our farm history for more information about our pioneering ancestor, Charley Burton, who was among the first to begin this practice in Washington. When cultivation began, choices were most often limited both by the type of tree that would grow in a grower’s specific climate and by a lack of species knowledge outside of what growers were already familiar with. 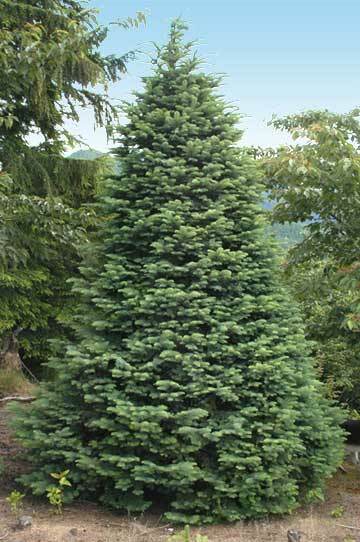 Today, with the capabilities we have to deliver trees over long distances and have them arrive nice and fresh, people are leaning more toward trees that stay fresh longer and retain their needles, such as the Noble, Nordmann and Fraser fir. Here at Bear Canyon, we have maybe the best climate in the world for growing these much sought Noble fir, and Fraser fir, Douglas fir, Grand fir, and Nordmann fir all do exceptionally well here. We offer all of these varieties in a wide range of sizes, grades, and densities to meet your marketing needs. The easiest way to see what sizes we have available is to check out our Order Forms & Price Requests. Our premium quality trees are hand selected according to your requirements for density and any other desired characteristics (taper, weigh, color). Our #1 trees, for nurseries and garden centers, have great shape and color, uniform density, and automatically include a percentage of premium trees. We also offer grades that include broader quality specifications. This is explained in more detail on our Order Forms & Price Requests page. We have fields of trees cultured for a couple of different marketing areas. For example, nurseries in the mountain states often request trees that are more layered and open (natural). But in areas of the country that traditionally used pine trees, tastes run more to a heavy, dense tree. We culture for both markets. You will see from our Order Forms & Price Requests page that you can select the quality of tree you want when you order. We guarantee quality in all of our trees. How do we do that? Click here to read more about our procedures for Assuring Quality. And if you need help with your order, visit our How to Order page.